Someone asked how to deal with a denialist on scientific topics. I think the process can be best explained using a flow chart. 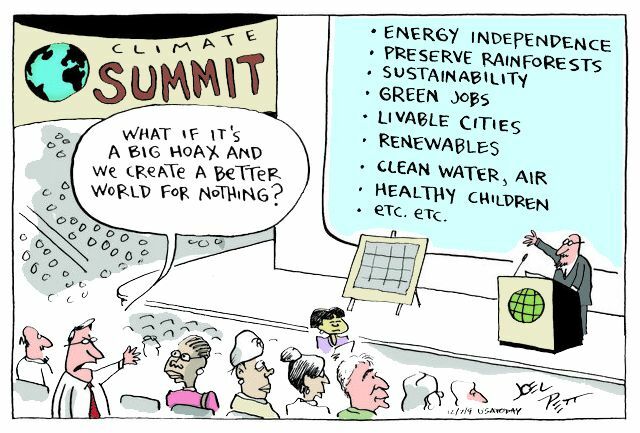 The first question is whether you're dealing with a fully committed denialist. You're never going to get Peter Duesberg to admit HIV causes AIDS or someone from the Heartland Institute to accept that we've got over a century's worth of science behind climate change. So if your first answer is "yes," then you have to think about whether an audience is present or likely to ever see the conversation. If not, then there's no point in engaging. You're never going to get anywhere with the individual, and nobody is going to benefit from the time you will spend trying. If an audience is present, then you have to be ready for the discussion to happen on the denialist's terms. They're going to nitpick every bit of evidence you have and throw out badly misinterpreted science faster than you can clarify it. Your opponent's goal isn't to help the audience to understand the science; it's to make you look bad and, therefore, to make people less likely to accept what you understand. Return the favor. They will say something absurd—it will either be something that's wrong, or something with absurd consequences, or something that they don't really understand. Latch on to that and don't let it go. Force them to address it. Ken Miller, a biologist who's involved in a lot of creationism/evolution debates, said his favorite tactic is to take some of the things that creationists say to their logical end. If creationists think that there was a global flood followed by an ice age, make them explain where the water came from, calculate where all the energy involved in freezing all that water went in a few hundred years—and then have them figure out where the energy that melted the ice came from. Another good thing to latch on to is a logical inconsistency. Climate change denialists tend to deride computer models, apparently not realizing they're used ubiquitously in science. So, there's a chance that some of the studies they like (because they suggest a lower climate sensitivity or something similar) also used a computer model. Call them on this, and don't let it drop. They'll also object to the policy implications of the science; they're separate, and it's often easy to make that clear. 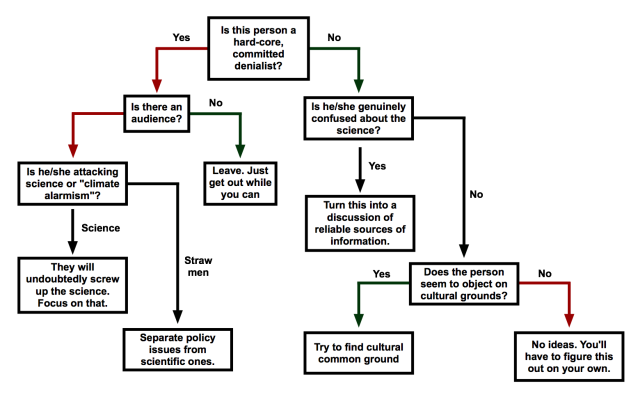 Moving back to the top of the flow chart, there's the option that the person you're talking with is not a hard-core denialist. In fact, the majority of people you'll talk to on any topic falls in this category. You may talk to someone who isn't pathologically, Ken Ham-style committed to believing the Earth is 6,000 years old but has heard from people who say that humans and dinosaurs could have lived at the same time. Or someone who doesn't know much about climate change but can't stand Al Gore. The majority of people who don't trust some aspect of science don't do so because they know science; they do so because a cultural group they belong to doesn't like some apparent consequence of the science. Here, the best thing to do is simply communicate with them without dismissing what they think. You can find out what exactly they object to and see if it's about the science. If so, you can work to try to help them understand how to find more reliable sources of information. If it's less about the science and more about culture or ideology, work on breaking down the cultural barriers by finding things in common with them. Maybe you both had parents who served in the same branch of the military or grandparents who came through Ellis Island. Maybe you share some of the same concerns, like worries about the future for the youngest members of your families. The key thing is that you have to get them past the feeling that anyone who accepts scientific evidence is somehow radically different from them, with completely different values and experiences. What you can accomplish depends on the person. Maybe you can get him or her to see the science as separate from the cultural concerns. Maybe you can shift the discussion into the realm of policy, ethics, or something else, issues that are really the foundation for their discomfort. Maybe you can get them to look into the reliability of the places they've been getting their information. Maybe you can just get them to read a few things they might not have otherwise looked at. But you have to be willing to accept this sort of incremental progress—nobody is going to have a sudden epiphany and completely revise their opinions overnight. You can be part of the process that changes people's minds, though. It might not be incredibly satisfying, but it's far better than being part of the problem by dismissing everyone with shouts of "denialist." And, over the years, I've gotten a number of e-mails or comments from people who have gone on to change their minds on various processes. And that is incredibly satisfying. People don’t accept scientific information for a lot of different reasons.